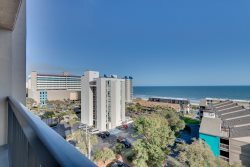 This premier Myrtle Beach family hotel resides oceanfront, giving guests easy access to the Atlantic, and hosts a wide array of fun, family friendly attractions near by that are sure to make it easy to call Coral Beach your home away from home. This beautiful ocean view efficiency has two double beds, flat screen Tv, a Kitchenette and a great view of the ocean. This unit is perfect for the family who want's in room amenities at a great price. Indoor and outdoor pool and a 350 foot lazy river!!! There is a .028% Processing fee added to each reservation.